The gist of this story is that I was sick of NVIDIA's sub-par macOS drivers causing the majority of my old Titan Xp's teraflops to go to waste in my FCPX workflow. It was regularly running the BruceX benchmark in ~45 seconds, significantly slower than it should be running. So I figured I'd get as close to an "approved" setup as I could. Enter the RX Vega64 by being on sale with only one left at Newegg, and their warehouse being a quick drive away from my house for will-call pickup. Add to that the 2016 MBP's price being cut by B&H by a thousand dollars and...yeah. Temptation bit hard. XFX Radeon RX Vega64, 8GB VRAM, "Silver Edition"
Boot laptop to login screen, close lid, plug in power, USB peripherals hub, and then eGPU in that order. The screen comes up, I log in, and I'm up and running. When I want to undock from the desk, I just make sure no apps are running on the eGPU (easily checkable via iStat Menus), and simply unplug everything. Most of the time, this works fine, and I can use the laptop normally. Windows is another story; I'll update this section once I get it up and running, currently dealing with Error 12 and haven't had time to troubleshoot it lately. EDIT: 10.13.4 betas are looking promising. Hot-plugging works, "closed clamshell" mode works, fan speed issue on Vega64 fixed. Can't wait for public release. FCPX performance is blisteringly fast. Remember that ~45sec BruceX benchmark from before? 18 seconds now. LuxMark 3.1 (luxball scene) score: 24,368. Geekbench 4 compute: 181,610, compared to my Titan Xp's 94,025 in macOS. Haven't done any OpenGL benchmarks mainly because the numbers will be worse than the TXp (heh) and I'm not really interested in OGL perf under macOS anyway. It's all about compute, baby. I think I'm liking the AMD / Apple ecosystem now. All I gotta do next is get into a TB3 chassis, but I'm glad the laptop is ready for the plethora of TB3 options that are out (and are coming out in the future). My only regret is how damned cool the TXp's shroud looked in the case...but Vega's just so much more useful until NVIDIA gets their act together. Super interested in this setup. Currently running a MacBook Pro w/touchbar + 1080ti + Akitio Node over TB3 setup. Thinking about switching to a Vega RX 64 for a speed boost, but I'm running a Premiere workstation. I was sold on the CUDA support for a while, but seeing numbers from the Vega just makes me think it will have much higher overall performance in Premiere and Davinci Resolve. Would you be able to test either one of those?? I have the latest Premiere CC installed as well as Resolve Lite. Anything in particular you'd like me to test? Any way to get a consistent benchmark going? I wish I had a good answer to that. Got any 6k R3Ds you could put on 30 second timeline and apply some luts and color correction on and see how long it exports? Very nice work, @p-mac! 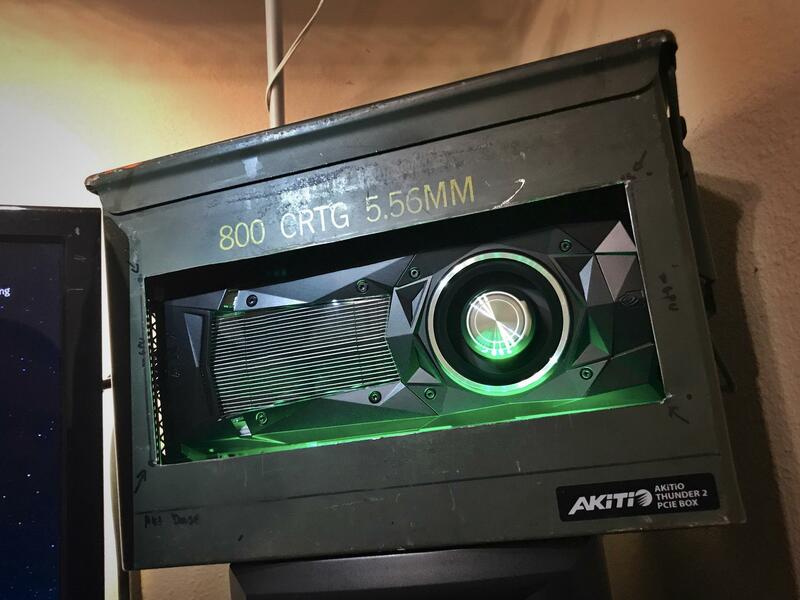 How's cooling with the Vega 64 in your ammo box? It tends to run hot in my experience so keep an eye on that. Have you tested the card in After Effects, Photoshop, Illustrator, Premiere? Hello, Akitio Thunder 2 is natively recognized in High Sierra??? the only certified and recognized TI83 chipset in the thunderbolt 3 boxes?? @simonasher Sorry, haven't gotten around to providing you export times yet. Trying to find a way to make this consistent for you to be able to test as well, I would like to upload a footage sample along with the same project file so that you can see and test for yourself what the difference in export speed would be. @agris Thanks, haha, I read about it in a (great) profile of Jony Ive by The New Yorker. As far as CC apps, all working fine. I rely on those apps (sans Premiere) on a daily basis for work. @john_petrucci Yes, the Akitio Thunder2 is recognized natively in High Sierra. I'm using the official Apple TB3 - TB2 bi-directional adapter. As far as I can tell, High Sierra is treating this like a "proper" External GPU: in System Profiler, the Vega64 shows "External GPU" under Type. The system does not appear to be treating it differently at all compared to a certified TB3 enclosure.